Let’s talk about fat for a minute. You CAN’T ‘spot reduce’ in terms of fat storage – meaning your body will burn fat and store fat wherever it wants to, terrible I know, but that’s the way it is. Doing any one exercise or a combination of several won’t isolate or target fat loss in one particular area, this is where several other factors come into play. You can control this however by – again – the quality of food that you eat or by exercising more. Now as far as muscle is concerned, you CAN control the size of your muscle to a certain degree (until you plateau), by doing isolated weight training exercises (bench press, dumbbell curls, etc). I won’t get into the ‘meat’ of this part because most of my clients have never even seen a gym, so I don’t want to get so far ahead of the game that you get discouraged. It would be like your College Professor teaching you Calculus 1 before you even had Pre-Calculus. Let’s just focus on weight management through nutrition for now. When you refer to a nutrition label, you will see ‘total calories’ and as equally important, the ‘serving size’ at the very top of the label. A lot of people will see a calorie count of 280 and say, ‘oh great, that’s not too many calories for a snack,’ yet they don’t see the serving size is 1 cup and they just had a few cups. Yeah, the calories can add up quick. 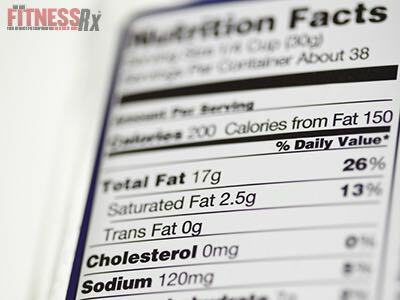 What’s just as important as the number of calories and the serving size, the source of those calories? What macronutrients are they derived from: protein, carbs, or fat, (and alcohol)? Alcohol isn’t a macronutrient but its calorie dense at 7 calories per gram, second to fat, which has 9 calories. Protein and carbs each have around 4 calories respectively. I prefer my clients to have the same ratio of nutrient intake as me, 50-40-10, protein-carbs-fat. It’s not always possible but something to strive towards; again the tweaking process can take 2 weeks, 2 months, 2 years, or even longer, there’s no set time limit – that’s why it’s a win-win formula. People set unreasonable goals for themselves and most can’t accomplish them for one reason or another. If you’re one of the few that can, go ahead and pat yourself on the back and sit this one out. This is Part 3 of our exclusive online series from certified nutritionist Trevor Adams. Be sure to visit his personal website and Facebook page.